Oilcloth is manufactured differently today, but you can make your own traditional oilcloth at home. It has many different uses and advantages, indoors and out. Oilcloth was originally referred to as “floorcloth” because it was an inexpensive, easy to maintain and durable substitute or covering to wood flooring. Linoleum is today’s equivalent to floorcloth. Early on, fisherman and sailors also found it ideal for sails. Oilcloth was first made from canvas treated with oil or, at times, alternative-waterproofing materials such as waxes or clays. Today, manufacturers use vinyl or plastic (sometimes a combination of both) on a mesh base made of cotton or polyester. Oilcloth fabric is water and stain resistant. The density of the material makes it strong and durable and the vinyl or plastic makes it easy to clean with soap and warm water. Oilcloth should be rolled up for storage to keep it wrinkle free. Oilcloth was historically made in bright colors, patterns and designs, but you can find more conservative styles today. Sold in rolls, oilcloth will not fray when you cut the fabric to size. Try browsing through oilcloth fabric selections online as this an easy way to get an idea of just how many prints are available today. 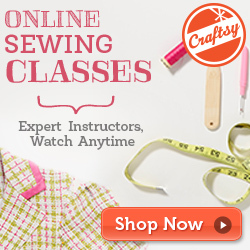 Read my tips for buying fabric online and have a great online shopping experience! Oilcloth is versatile and can be used for many simple sewing projects . Use it in the kitchen for placemats and tablecloths; in a laundry or pantry, it can cover shelving or line the inside of drawers. It is also practical for a baby’s changing table, high chair, booster cover or a diaper bag. Outdoor uses include grill covers, picnic table liners, outdoor pillows, raincoats, tents and waterproof bags. 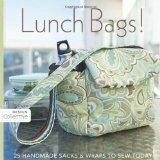 Why not try making these attractive little lunch bags! In addition, a creative and crafty use for oilcloth includes an oilcloth message board to hang in a kitchen, office or family room. Why not make oilcloth coasters to use up leftover pieces of fabric from a finished project. You could also stretch oilcloth over a frame as a piece of artwork. The advantages of oilcloth fabric far outnumber its disadvantages. PVCs are a nondegradable part of plastic products. High levels of exposure can be unsafe for a child who may place the fabric in his or her mouth. This material is not suitable for recycling. It can be considered an eco-friendly choice, however, if it will be used for a long time because it doesn’t need to be cleaned with much water or chemicals.